Arrrr! 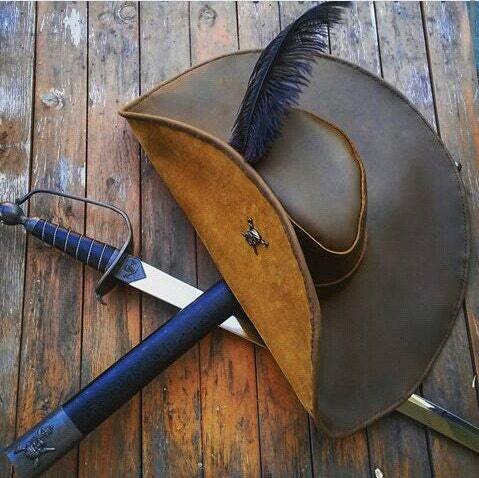 This leather buccaneer hat will make you feel like you are on the high seas or fighting along side of the Muskateers! This leather hat is hand stitched with heavy duty waxed nylon thread and constructed of soft, supple stoned oil leather, made to last a lifetime! Wire brim makes this hat very shapeable. These hats are made to order and are made to your specified size. Specify feather color in notes- choose from white, black, red, or yellow. Comes with skull and crossed swords concho- different conchos are available on request. Perfect to complete your Pirate or Muskateer style costume!